Our Christmas cake decorating courses are in full swing, ensuring our cake decorating students are all prepared to create their very own Christmas cake master-piece! We have also launched our new Children’s Christmas cake decorating course. The course has been very popular with our Sugarbliss younger students and the cake designs the children have created have been absolutely magnificent. We are really looking forward to the next children’s cake class at the beginning of December. It is always so much fun to create Christmas wedding cakes especially when the clients theme their special day. 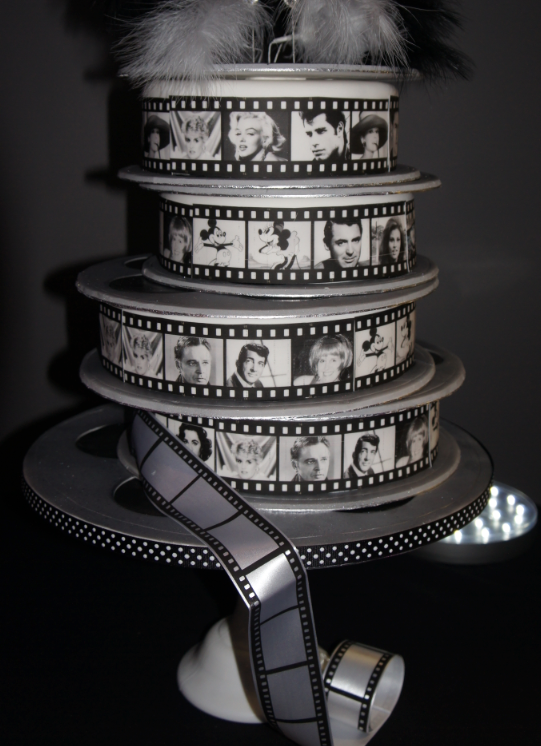 Our Hollywood film wedding cake really did fit the occasion, with the guests all in fancy dress as their favourite film stars. The venue was completely themed with everything to do with hollywood stars and looked incredible with our cake taking centre stage! Some new cake decorating tools that have recently arrived in our cake decorating shop are the fantastic new FMM press and ribbon press. These wonderful tools allow you to simply mark out regular dots on the side of a cake for piping by quickly pressing the tool against the cake forming rows of pin holes to allow you to decorate the cake. It was wonderful last Wednesday to be invited by The Members Of Knowle & Dorridge Inner Wheels Club, at the Forest Hotel, Dorridge. After a delightful evening meal with the 50 plus members of the club, we were then invited to demonstrate our cake decorating skills to the members. During the demonstration we created a fantastic but simple, eye catching Christmas Cake. Using various cake decorating tools we showed how to make a Christmas teddy bear and a 3d Christmas tree decoration. Our cake was then donated to the members and raffled for charity. We are very excited with our new range of Christmas cake decorations, recently arrived in our cake decorating shop, Knowle, Solihull, Warwickshire. We have a delightful selection of Christmas cupcake cases, edible Christmas sugar decorations, Christmas messages, figurines, frills and ingredients to help you to create your perfect and delicious `Christmas cake.